The industrial revolution that transformed western Europe and the United States during the course of the nineteenth century had its origins in the introduction of power-driven machinery in the English and Scottish textile industries in the second half of the eighteenth century. But far more than the cotton textile industry was transformed in the course of that revolution. Non-industrial wage labor increased; urban centers grew; and in farming areas, outwork occupations and commercial agriculture transformed the rural labor market. Finally, these economic developments coincided with dramatic changes in family life, particularly declining family size and increasing life expectancy. A greater role for women in the labor force, contemporary politics, and reform activities was certainly one of the unintended consequences of technological change in nineteenth-century America. The industrial revolution in the United States was dependent from the outset on the transatlantic movement of British immigrants and British technology, including the adoption of the spinning jenny, water frame, and spinning mule that made the textile industry possible. The flood of British exports to the United States after the American Revolution stimulated efforts to replicate the inventions that gave English manufacturers such an advantage in the American marketplace. Out of these efforts emerged the first permanent cotton spinning mill in the United States, in Pawtucket, Rhode Island. English emigrant Samuel Slater—himself a former apprentice at the English textile firm of Arkwright & Strutt—reconstructed an Arkwright water frame under the sponsorship of Providence merchants William Almy and Moses Brown. The firm of Almy, Brown, & Slater pioneered in the machine production of cotton yarn between 1790 and 1840. This company expanded, gave rise to a number of other firms, and established the basic set of business practices that came to be called the Rhode Island system. These southern New England textile firms followed British practices, employing entire families, with children comprising the vast majority of the mill workforce. While the mills focused on carding and spinning, they relied on rural and urban hand weavers to finish the cloth. 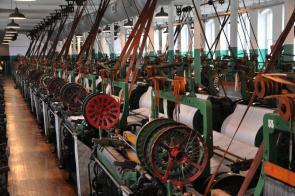 Thus the first cotton textile mills were very much a part of the region’s rural landscape. Textile mills of the Waltham-Lowell system sprang up across the northern New England countryside between 1814 and 1850 and grew steadily across the second half of the century. Mills of the Rhode Island variety expanded as well, and the earlier regional differences faded over time. At mid-century, New England’s textile workforce had grown to number 85,000 producing cloth goods valued at $68 million annually. Adding in a substantial textile industry in the Philadelphia area, cotton and woolen textile mills were the nation’s leading industrial employers at this date. The adoption of the power loom permitted the vertical integration of all steps in the cloth manufacturing process under a single roof. From opening the bales, to carding, spinning, dressing the warp yarn, and finally weaving the cloth, all production steps were conducted within the mill. This change led to a change in the labor force as well. Both the power loom and the dressing frame required fairly tall workers and children simply wouldn’t do as they had for the mills in southern New England. Thus, the Waltham company depended from the outset on a workforce of young, single women recruited from the countryside. The firm reached far into the countryside for this workforce and had to construct boardinghouses to accommodate the rural women it recruited. Finally, to entice this new pool of labor, management offered monthly cash wages, a definite competitive advantage in comparison to practices in the family-style Rhode Island mills. Between 1830 and 1860, women remained a key labor force for this growing industry. Mill superintendents paid recruiters to circulate through northern New England and to bring suitable young women to work in their mills. The wages, typically set at $3.00 to $3.50 per week, were much higher than anything farm daughters could earn in their hometowns and proved a strong attraction. What motivated young women to leave their families in the countryside to work in the mills of New England’s growing urban centers? Between analysis of the economic backgrounds of the families of mill women and what they had to say in their correspondence it is clear that mill employment permitted young women to earn their own support without depending on their families; second, the wages permitted young women to save something for their future marriages; finally, some daughters used their earnings to assist their families. On the whole, a mix of personal and familial motivations led daughters to leave their farming homes and take up mill employment. There was, in fact, a continuum stretching from those who went to the mills for entirely personal reasons and those who went to earn money to help support their families. Long-term economic considerations—particularly how to save in anticipation of marriage—had more to do with the migration than the short-term consideration of immediate self-support. Women came from farming families that were able to maintain a modest standard of living. So it was not poverty, per se, but the lack of future opportunities that pushed young women into the mills. And while young women were attending to their futures, and supporting themselves in mill towns, they achieved a measure of economic and social independence not possible while living under the parental roof. Beyond the economic consequences of the growth of factory employment, significant cultural changes accompanied women’s work in the early mills. Contemporaries repeatedly expressed concern that the mills were making young women unfit in a variety of ways for what was expected of them as nineteenth-century women. Some were concerned that mill employment made farmers’ daughters less fit for marriage because they had become citified. They argued that the urban mill experience made young women dissatisfied with the country life of their parents. Thus one writer complained in 1858 that young working women no longer wanted a farm life. “They contemn,” he wrote, “the calling of their father, and will, nine times out of ten, marry a mechanic in preference to a farmer.” And this perception was based to a considerable degree on reality. Tracing a sample of mill women over their lifetimes reveals that only about a third married men who were farmers or farm laborers and only a quarter of those who married lived the rest of their lives in their hometowns. Mill employment led many rural women to marry artisans or other urban workers and to migrate from the farming homes of their youth to New England’s growing cities. Young people voted with their feet and their elders did not approve. Mill employment also led some farmers’ daughters to become engaged in the reform movements of the antebellum decades. There were labor protests in Lowell and other New England mill towns in the 1830s and 1840s, and the women who became involved in these struggles were active across a wide range of reform activity. The height of labor protest in the New England mills before the Civil War came with the emergence in the 1840s of a Ten Hour Movement aiming for reduction in the hours of labor in the mills. The mills ran for seventy-three hours a week in this period, averaging slightly more than twelve hours a day. As the pace of work in the mills increased without any wage gains, millworkers came to demand a ten-hour workday, giving them time to relax, attend meetings and lectures, and participate in the urban cultural scene around them. These protests built on earlier strikes, known as “turn-outs” in the language of the time, reveal much about the sensibility that New England women brought to the mill experience. In October 1836, on the occasion of the second turn-out in Lowell, women founded the Lowell Factory Girls Association to organize their protest. The preamble to the association’s constitution reveals mill women’s sense of themselves as “daughters of freemen” and their connection to the young nation’s republican tradition. The mill women, some 2,500 in number, left the mills to protest an increase in charges at company boardinghouses unaccompanied by a corresponding increase in their wages. The women held out for several months and displayed a keen sense of tactics in their struggle with the mill agents. In the end, the companies reduced boardinghouse charges for a good proportion of their workers, and the mill women returned to work. Ten years later, women organized the Lowell Female Labor Reform Association with a view to restricting the hours of labor. The association survived for two and a half years and organized petition campaigns calling on the state legislature to set ten hours as the legal limit for the working day. Republicanism from the revolutionary tradition and perfectionism from evangelical Protestantism were two major threads that both working men and working women drew upon to protest the new impositions of industrial capitalism in nineteenth-century America. These traditions also led mill women to become involved in a variety of other reform movements. Anti-slavery was strong in Lowell and mill women sent several petitions to Washington opposing slavery in the District of Columbia and opposing war with Mexico, which might contribute to an expansion of slavery into the Southwest. Woman reformers came to see opposition to black slavery and wage slavery as related causes. Some also participated in the women’s rights conventions that mushroomed after the first one was held in Seneca Falls, New York, in July 1848. Mary Emerson, a leader in Lowell’s ten-hour movement, attended a women’s rights convention in Worcester, Massachusetts, in October 1851. She shared the broad reform perspective that launched woman mill workers into labor protest in these two decades and contributed to the widening perspectives of American women in politics and social reform in the mid-nineteenth century. The experiences of mill women demonstrate that factory employment not only brought women’s work out of the home but also provided women a collective experience that supported their participation in the world of broader social reform. Lowell women became involved in anti-slavery, moral reform, peace, labor reform, prison reform, and women’s rights campaigns. Furthermore, working women, like working men in this period, drew initially on republican traditions to defend their rights and interests but ultimately came to justify their concern for social justice on a combination of religious and rationalist grounds. They came to oppose the growing inequality evident in American society and to demand for themselves as workers and as women greater rights and rewards in that society. Thomas Dublin is State University of New York Distinguished Professor of History at Binghamton University, SUNY and co-director of the Center for the Historical Study of Women and Gender. His books include Transforming Women’s Work: New England Lives in the Industrial Revolution (1994), Farm to Factory: Women’s Letters, 1830–1860 (1981), and Women at Work: The Transformation of Work and Community in Lowell, Massachusetts, 1826–1860 (1979).